In Jesus – powerful lyrics from Sandeman and Fellinghams, brought to life by Lou’s soaring vocals. Building on the much loved PHAT sound, new guitarists Ben Hall and Jos Wintermeyer make their mark with pumping tracks ‘In Jesus’ and ‘No One Like Our God’ while the beautiful ‘If I Have Not Love’ and 'Pardoned’ show the bands diverse vocabulary and sensitivity. This album is not to be missed! 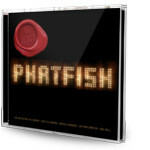 The Phat Pack has extra tracks, sheet music and more!